"This was an avail that I think has been speculated about and overhyped," said Commissioner Gary Bettman, as he stood at a podium an hour before the most important game in Phoenix Coyotes history, at a press conference the NHL arranged, in order to detail whether the Coyotes would finally have an owner to spare them from relocation. "We had a series of meetings this afternoon with Greg Jamison and the city of Glendale, and basically the status of things is that we have an understanding with Greg Jamison that we're going to proceed with he and his group to reach a formal agreement for the purchase and sale of the Coyotes," said Bettman. "While Greg is working on that with us, he's also going to simultaneously look to conclude an agreement with the city of Glendale"
In essence, this was Greg Jamison's debut as the latest suitor for the Coyotes — the fourth public one by any measure save for Bettman's, who disagreed with the number. The former COO of the San Jose Sharks, Jamison said he has a "group that's excited about going forward as the owners of the Phoenix Coyotes. We have a group that cares deeply about the National Hockey League, about hockey and about youth hockey." Who's in is group? Jamison will reveal it at a later date. What's the timeline for completing the deal? Bettman wouldn't give a date, but hoped it was weeks rather than months. Will there be an out clause in whatever lease agreement Jamison's group strikes with the city of Glendale? It wasn't asked. So the press conference didn't tell us much. But it happened. And that's real takeaway on Monday night — that the NHL felt comfortable enough with the bid, the financing and the progress with the city behind the scenes to announce a tentative agreement an hour before Game 5 between the Coyotes and Nashville Predators. We've had so many false starts, so many dead ends in this 2-year ordeal that the process invites cynicism. The finish line is visible, but it's surrounded by quicksand and landmines and quicksand with land mines in it (that's, like, really dangerous). The NHL is laying it on the line with everyone from the media to Coyotes fans: Be cynical, be cautious, but this time it's going to be different. "The future we believe is very bright," said Jamison. • Jamison talked about the path of the franchise, and how there's been groundwork in place for the last few years. He likes the forward momentum. He said he made a call to Bettman about a year ago expressing his interest. • Jamison said he's had numerous meetings with the city, and that he feels a lease agreement for the Jobing.com Arena is "on the right track." The city lease deal will be completed before the Board of Governors gives its rubber stamp. 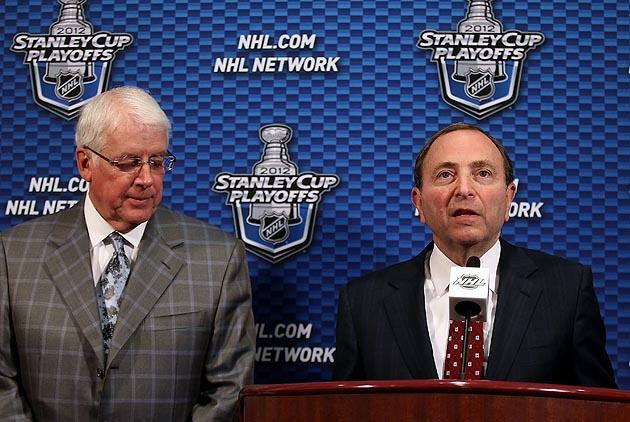 • On the money front, Bettman stopped short of an endorsement of the financial state of the bid. "With the group that Greg has assembled, he's comfortable that the financial wherewithal is there. We'll continue to do our due diligence as we do on any franchise ownership transfer." • On a third party like the Goldwater Institute submarining this effort: "I can't predict what third parties can't do." That said, he's confident that the structure of this deal will allow them to "proceed and ultimately prevail." • On Quebec City, Bettman again reiterated that the goal is to keep the Coyotes in Glendale and that no other options have been explored.